Proper flagships are coming in pairs lately as every maker is trying to cater for different crowds. Apple, Samsung, HTC and Sony - but also Oppo, Meizu, Huawei. Until recently the breakdown would've implied ones to watch and learn from vs. ones to compete with but the market is changing. Up and coming Chinese makers have really hit a stride. Xiaomi here has done a fair deal of watching and learning, and still haven't entirely outgrown the copycat phase. Yet they do have not one, but two flagship phablets that seem capable of challenging the big guys. Today we meet the Mi Note, the first of the two to make it to the market. Unlike the Mi Note Pro, which uses all the latest tech such as a QHD display and the controversial Snapdragon 810 chip, the Mi Note is still one foot in 2014 with a 5.7" 1080p screen and Snapdragon 801. 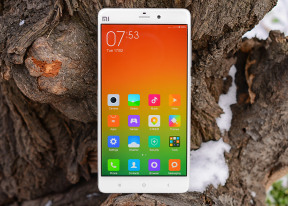 But don't be mistaken - Xiaomi has spared no effort in making the Mi Note a looker, enhancing its camera department and polishing its MIUI 6 launcher. The moment you grab a Mi Note - you'll know you are handling something new and special. Some of the highlights of the smartphone are the 13MP rear camera with optical stabilization and 4K video recording, as well as the promising front 4MP UltraPixel selfie sharpshooter. Other things of interest include dual-SIM support, 4G LTE and a 3,000mAh battery. Once you are past the nice metal frame and you've had enough exploring the rear curved glass, you'll be greeted with the new flattened MIUI 6 software. Our hopes that Xiaomi would eventually consider microSD card slots on its flagships were left unanswered. The Mi 3 and Mi 4 didn't pack a memory slot either, so it isn't much of a surprise. The Snapdragon 801 chip doesn't support an FM radio by default and requires extra chips to do so - Xiaomi chose not to bother. Finally, the unibody build doesn't allow for a removable battery and this will be a red flag to some, though hardly a dealbreaker. We've seen many manufacturers moving to various unibody designs at the expense of having a non-removable battery and we can't say we're that disappointed. The lack of a microSD slot is an entirely different thing though - plenty of room for one in a phablet after all. We know you are all eager to see the Mi Note in action, so we are done introducing it. Our traditional hardware checkup kicks off right after the jump. Its main camera focus is not working properly, can anyone guide me to get rid of the issue.